What an honor it was to have The Most Reverend David D. Kagan, D.D., J.C.L. join us for evening prayer and dinner on May 6. 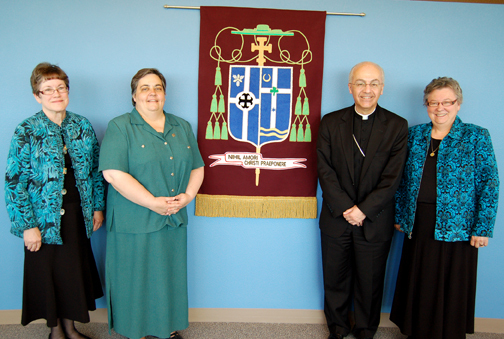 Bishop Kagan was presented a beautiful Coat of Arms, created by Sister Nancy Gunderson and Sister Rosemary DeGracia, both of Annunciation Monastery. The right side of the arms represents His Excellency Bishop Kagan's personal and priestly heritage. (The following text is written by Deacon Paul J. Sullivan): At the base of a blue field are alternating blue and gold (yellow) wavy bars, to represent water, as at a ford in a river, the Rock River, emblematic of the Bishop's faithful service to the Diocese of Rockford, in Illinois, until his selection to receive the fullness of Christ's most holy priesthood, as a bishop, as he takes up the mantle of Bishop of Bismarck. Issuant from the wavy bars is a silver (white) cross of The Faith that is charged with a six-point blue star, reminiscent of the "Star of David," to indicate that the Bishop's father was a convert to Catholicism from Judaism. Above, and also on the cross is a green trefoil (three-petal flower to represent a "shamrock") to indicate the Irish heritage of His Excellency's Mother. To the upper left of the cross is a gold (yellow) crescent to honor the Blessed Virgin Mary, in her title of the Immaculate Conception, patroness of the United States. For his motto, His Excellency Bishop Kagan has selected the Latin phrase "NIHIL AMORI CHRISTI PRAEPONERE." This phrase is taken from the "Rule of Saint Benedict" (4:2) and expresses His Excellency's abiding personal goal for all Christians, "Prefer nothing to the love of Christ." Sister Edith Selzer's text (following), explains the oak leaves and acorns on the Diocesan Coat of Arms: This symbol has been on the diocesan coat of arms since Bishop/Abbot Vincent Wehrle. It is a symbol of Benedictine stability and strength. A Latin motto goes with it: Secuti veracit, which means "cut down, it grows again," like the durable oak tree. This motto came into being because of the multiple times Monte Cassino was destroyed by barbarians and later war bands, including the United States of America in WWII, yet it was always rebuilt and filled with monastics. Abbot Wehrle and his monks served many of the early parishes before the diocese was formed, and they still do. Benedictine Sisters from St. Joseph, MN, came in 1878 to start schools and do catechesis, and became involved with health care by 1885. Another foundation of Benedictine Sisters from a different Mother foundation came a bit later to serve the needs of Native Americans and to teach in schools. The significant role Benedictines played in the foundation of the diocese accounts for the presence of this symbol on its coat of arms. With over 200 hours creating this masterpiece, Sister Nancy Gunderson and Sister Rosemary DeGracia say that being asked to do this work was an honor. The coat of arms that will hang above the Bishop's chair in the Cathedral of the Holy Spirit is a prayer from the Benedictine Sisters of Annunciation Monastery.